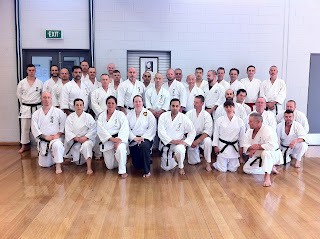 Melbourne was the 1st leg this year for Sensei’s Australian visit, before he headed off to the Gold Coast, Queensland. Sensei’s seminar was once again filled with great Kihon, hidden messages, light bulb moments and “no clue” moments, all in all leaving us with a deeper understanding of his principles, which to me sounds like a typical Taira Sensei seminar. Sensei found the venue used again this year, to be suitable and well-spaced out for our 38-40 students who attended on both the Saturday and the Sunday sessions. We had a large mix of Goju based students along with a few different styles, which was pleasing to see. People travelled from all parts of Australia, which was also pleasing to see. Sensei seemed relaxed yet enthusiastic, keen to train and always willing to share. This is a special trait of Sensei’s and makes him who he is, which to a large part, is what keeps us all wanting to learn more from him. In attendance, we also had the pleasure of Bryson Keenan Sensei, who made the visit back home to Oz to see family and train with old and new friends. Bryson Sensei always has great tips for one and all regardless of rank. He helped to keep everyone engaged and ensured that the first timers were able to grasp Sensei’s concepts. His quick one liners, whether it was during the seminar or after, always hit the mark. It was great to have him back home again for a short stay and his guidance over the asia pacific region is well received and appreciated. At a special Friday night session, Sensei oversaw a grading of 5 of his Kenkyukai students, ranging from Nidan through to Godan. Sensei was happy with what he saw, but wants to ensure that there is good focus on distance (with use of mainly zenkutsu dachi rather than sanchin dachi), kime and good body posture. Monday night was a class involving instructors along with their supporting Uke’s who run “affiliated Dojos” attached to my Dojo. There are currently 7 Dojos under this affiliated program. These Kenkyukai members are running great Goju Ryu Kenkyukai Dojos in line with Sensei’s methods, and one day hope to be Shibuchos in their own right. During the session, Sensei provided us with a great break down and guidance of Kata (Gekisai through to Seiyunchin) and Kihon applications. It was reassuring to see that we are all on the right track, yet always with so much more to learn. I thank these affiliated Instructors for their continued support and zest for knowledge in our Kenkyukai. 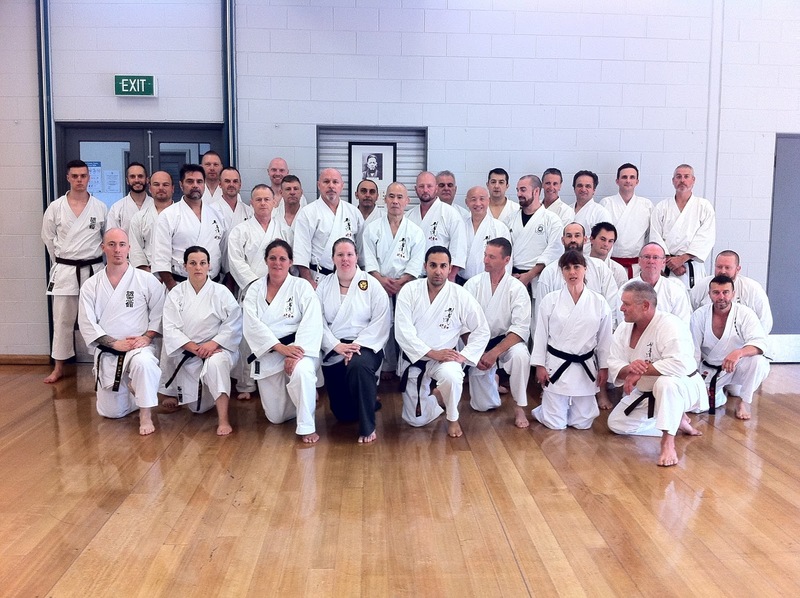 Thanks again to all those that assisted me with Sensei’s visit and to Damien Martin Sensei for his support and ensuring that Taira Sensei comes out to Australia each year to conduct Melbourne/Gold Coast seminars. We can’t wait for 2017.